Beautiful technology from Artnovion and Basalte; amazing digital artwork from Barco, Philips, Niio and Genesis; VR workplace of the future; and incredible projection mapping demos were the must-see hits of ISE 2018. 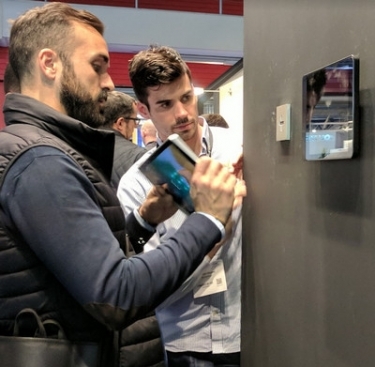 Basalte might have one the design category at ISE 2018 with the new Eve Plus iPad mount and charger that matches a full suite of smart-home controllers and dumb old switches. The Cisco VR demo provided a glimpse of the future of teleconferencing. There was also a big 98-inch mirror TV from Agath. Artnovion had some gorgeous acoustical treatments that looked more like architectural marvels than utilitarian sound diffusers. Speaking of gorgeous, Basalte continues to add to its suite of stylish electronics that already includes smart pads, speakers, outlets and night lights. Brand new for ISE 2018: the Eve Plus line of magnetic wall mounts for iPads. Meanwhile, Optoma's projection-mapping display was a re-creation of the mesmerizing and whimsical "Le Petit Chef." Also, the HDBaseT stand showcased the technology's flexibility, something other video-distribution "standards" cannot provide. The two most compelling spaces at ISE were both powered by Niio, the company that stores, protects and serves up digital artwork. Barco showed some "moving" pieces in room E107 (shown above). Because they're displayed on Barco's LED "digital canvases," the works show no signs of glare, even when displayed under typical "museum lighting." Nearby, in room G108, there was even more beautiful moving artwork, including an interactive piece that would be the hit of any dinner party. The space was sponsored by Philips and hosted by European distributor Genesis Technologies. Here are a few other companies with experiences that are difficult to convent in words, photos and videos. Check out more ISE 2018 news, products and technologies from CE Pro.